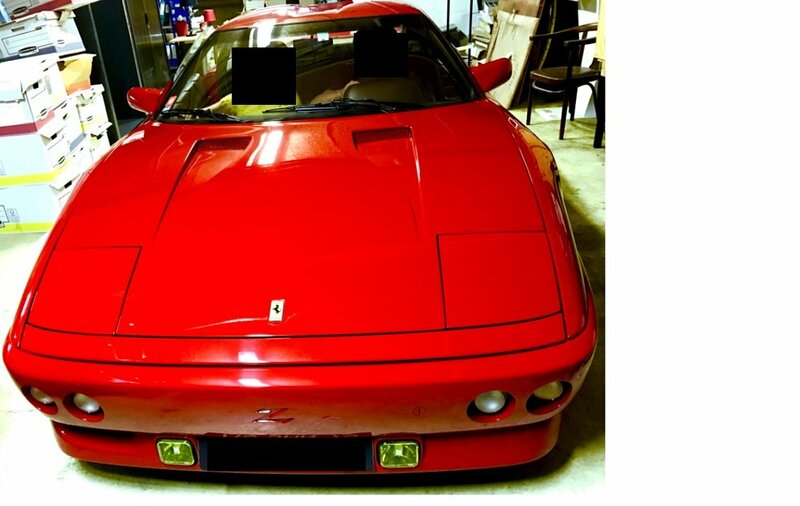 Between 1991 and 1992, a number of owners let Zagato extensively modify their 348 TBs into Zagato Elaboraziones. While the cars certainly looked faster then there stock counterparts, the engine and running gear remained identical to the 348 TB. This makes sense, as Zagato wasn’t in the tuning business, and each owner could upgrade his/her car elsewhere as they wanted. Zagato nearly rebodies the entire car with hand-made aluminum panels that flirted with Pininfarina’s original shape: At the front the car a new bumper removed the original’s fake central grille and replaced it the prancing horse. Each side was flanked with enlarged NACA ducts for engine, and these sat above matching side skirts. At the rear Zagato fabricated a new engine cover with a clear glass section to reveal the V8 below. Not until 2000 did Ferrari copy this idea with the 360 Modena Spider. At the rear, a new triple light arrangement and an electronically-operated spoiler were added. Modifications was made to the Double Bubble roof which was a signature Zagato touch dating back to the 1960s. The idea was that Zagato could lower the roofline of a car, but retain enough headroom for each occupant. It was an elegantly simple idea which no other design house has since picked up. Other Elaborazione modifications included custom OZ Racing alloy wheels, external fuel filler caps and a completely reworked interior including a three-inch rear view screen and suede upholstery. Zagato initially announced a production run of 22 examples, but only 10 cars were made. Each shares a distinctive look. This particular example has travelled 3,000 kms since new. Equipe from factory with rear camera. Pristine example.